Import meshes into Autodesk® Revit®! Within limits, all kinds of shapes and objects can now be brought into the project environment. Meshes in OBJ format may be made from free-form modeling software such as Autodesk Meshmixer or can be generated from photogrammetry. Thank you Eric for working so hard to get me a result. Despite a technical hiccup you stuck with me to ensure a positive outcome at the end. Looking forward to supplementing my models with meshes from now on in! In a View's Graphic Display Options dialog try turning off "Show Edges" http://help.autodesk.com/view/RVT/2018/ENU/?guid=GUID-6AFBA7D1-D5BC-4B80-B889-B6D2409CA875 . Besides that, you could try modifying your meshes in separate mesh editing software such as MeshMixer. In a View&#39;s Graphic Display Options dialog try turning off &quot;Show Edges&quot; http://help.autodesk.com/view/RVT/2018/ENU/?guid=GUID-6AFBA7D1-D5BC-4B80-B889-B6D2409CA875 .&#13;&#10;&#13;&#10;Besides that, you could try modifying your meshes in separate mesh editing software such as MeshMixer. For troubleshooting, see http://truevis.com/troubleshoot-revit-mesh-import/ . Revit version must be English. You can send an OBJ to me at design@truevis.com to check for importing into Revit. App is for English language Revit, only. Customer supplied OBJ which imported without error in English language Revit. Non-English language functionality may be in a future revision of the app. Can you support the import of material and textures? Material can be set by Category in Views. MTL for OBJ is not supported. It didn't meet my needs but the service was awesome. Eric refunded my payment within 30 minutes of my request. Thanks. Perhaps the mesh I was hoping to work with was not very good. I was hoping to trace a point cloud to convert it to a basic floor plan. It was imported, but it won't help me with my projects. The app works with meshes that are manifold. A mesh made from a building is not likely to be manifold. Suggest to use the point cloud feature of Revit to trace points. File type is RCS. 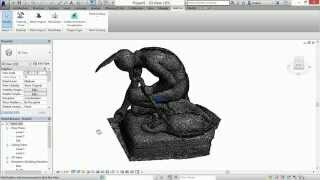 MeshLab is one program that can export an XYZ point file from a mesh. That can be converted to RCS in ReCap. Meshes aren't scalable in Revit If you try to import a mesh made with Autodesk ReMake using the standard scaling option, its about the size of one billion units. If you try to change this during import, it pulls the whole thing to shreds. Quite frustrating. The app creates DirectShapes. DirectShapes are not scalable in Revit, That is why the app has a scale input field in its dialog. See http://revthat.com/wp-content/uploads/sites/10/2018/09/img_5ba28d5220c00.png See also http://revthat.com/preparing-meshes-for-import-to-revit-as-directshape/ about preparing meshes for import. The app creates DirectShapes. DirectShapes are not scalable in Revit, That is why the app has a scale input field in its dialog. See http://revthat.com/wp-content/uploads/sites/10/2018/09/img_5ba28d5220c00.png&#13;&#10;&#13;&#10;See also http://revthat.com/preparing-meshes-for-import-to-revit-as-directshape/ about preparing meshes for import.